As much as we love our sky-high heels, the searing pain at the end of a long night is something we could live without. For every party animal who’s ever doffed her stilts at the risk of stepping into mystery crud, there’s Afterheels, a line of post-shindig ballet flats that are designed to wear like a slipper but are compact enough to fit inside a cigarette-carton-size box. British inventor Michael Stead—now known as Michael Shoomaker to his friends—even commandeered a bunch of old cigarette vending machines to dispense his biodegradable, environmentally friendly shoes. The best part: They cost less than £5 (US$8) per pair. Stead came up with the idea of a compact, after-party comfort shoe when a friend’s heel-induced accident left her bedridden and soured her vacation. 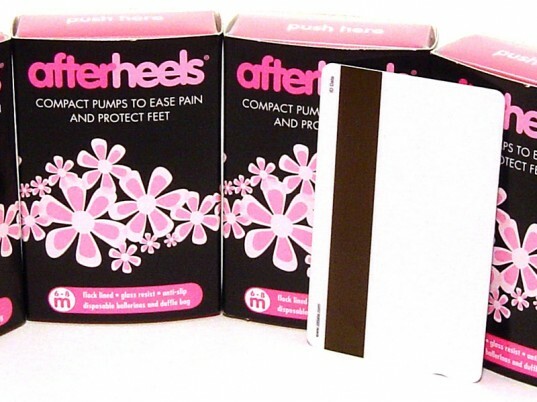 Before launching Afterheels, Stead prudently sought feedback from podiatrists and hundreds of women. The ideal post-heel flat, he discovered, has to look great, is as comfy as a slipper, protects against broken glass, takes up as little room as possible, and doesn’t cost much. The body of the shoe comprises natural, sustainable materials that biodegrade in the same time as an oak leaf. 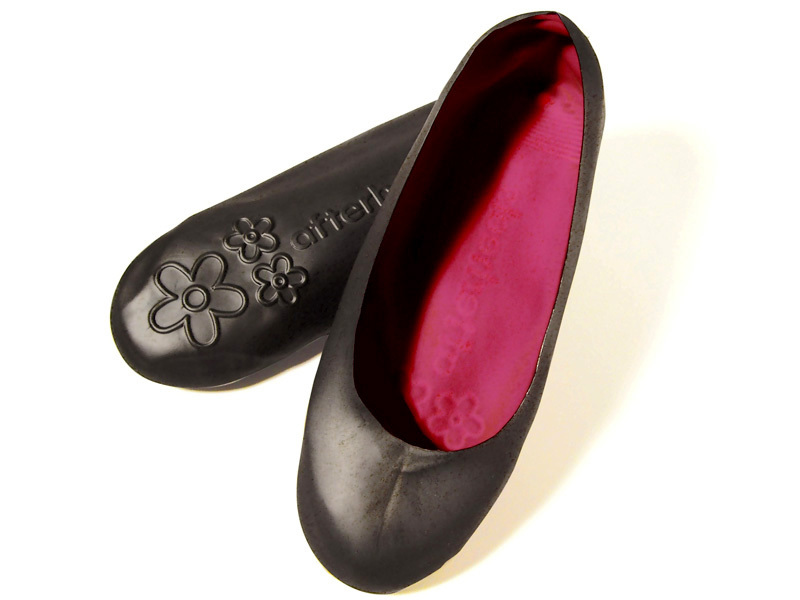 Afterheels, which fit inside a clutch, offer a waterproof outer layer and a soft, protective insole that guards against glass and other sharp dangers on the street. Made locally in England, the flats come in a variety of colors, including beyond-reproach black. The body of the shoe comprises natural, sustainable materials that biodegrade in the same time as an oak leaf, according to Stead, while the polypropylene (that’s #5 plastic) insole is fully recyclable. The ballerinas are currently sold in nightclubs across the United Kingdom, including Birmingham, Cambridge, Leeds, Nottingham, and Sheffield. As much as we love our sky-high heels, the searing pain at the end of a long night is something we could live without. For every party animal who's ever doffed her stilts at the risk of stepping into mystery crud, there's Afterheels, a line of post-shindig ballet flats that are designed to wear like a slipper but are compact enough to fit inside a cigarette-carton-size box. British inventor Michael Stead�now known as Michael Shoomaker to his friends�even commandeered a bunch of old cigarette vending machines to dispense his biodegradable, environmentally friendly shoes. The best part: They cost less than �5 (US$8) per pair.